Click here to check out the end-of-year committee reports and the approved 2019 budget, and meet your newly elected vestry members. God continues to bless St. Matthew’s Preschool in so many ways. Not only did we come into the school on the Tuesday after Labor Day to a dry preschool (as opposed to last year’s flooding), but we have been blessed to start our school year at almost full capacity! Out of 100 spots, 94 are filled, leaving just six toddler spots open. While we welcomed five new teachers this year, we love that more than half of our staff of 19 have been here for ten years or more – two have been teaching here for more than twenty years. All five of the new staff have recently had or currently have children that attend St. Matthew’s Preschool. St. Matthew’s Preschool is dear to our hearts, as each one of our children have attended this school. We know the difference we make in the children’s lives because we see their growth each year. We want them to be successful in their future school endeavors, and we love providing the atmosphere, love and learning that can help them accomplish that. We hope that when they leave St. Matthew’s Preschool they will take a piece of our loving, patient, nourishing hearts with them, and that they will love school. God has definitely put us in a place where we can share His love and pay forward the blessings He provides. Matthew 28:19 tells us to go out and make disciples of all the nations. Since we as a school can’t go out and do so, God has brought the nations to us! We love and appreciate our school’s diversity. If you haven’t seen the map in the preschool hallway (on the wall on the right), be sure to check it out. 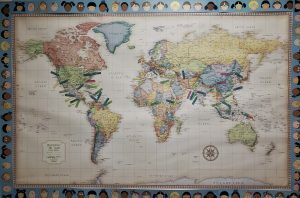 The world map shows where our student’s families have come from. Our families really enjoyed adding their family to the St. Matthew’s Preschool family via the map. They even made a few connections knowing there were others from their home countries there at school together. As part of the church’s outreach ministry, we are blessed to be able to touch so many lives from so many places, from around the US to all around this country and the world—twenty-one different countries and eleven US states! Here is how far this outreach ministry reaches: Mexico, Guatemala, Jamaica, Dominican Republic, Curacao, Guyana, Canada, Belgrade, Spain, Lebanon, Romania, Nigeria, Kenya, Tanzania, Ethiopia, Iran, India, Pakistan, China, Taiwan, Vietnam; and—besides Georgia—Ohio, New York, Pennsylvania, New Jersey, Florida, New Mexico, Kansas, Nevada, California, and Alabama. In God’s timing, He has blessed us with the ability for the preschool to purchase a new playground. This has been a long-term dream of the preschool’s executive board, and God has helped bring that dream to fruition. We eagerly wait for the new playground to be delivered and installed sometime in October. 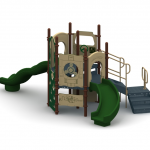 The new playground will include a new layout with new equipment, new timbers (plastic fun timbers will replace the existing wooden ones) and mulch. We are so elated – and that’s just the staff! We can’t wait to see the excitement of the children when they get to see it and play on it for the first time. Last, but not least, we want to thank the St. Matt’s community for continuing to support our school with your financial, spatial and supplies donations. Our supply bucket wish list was 90 percent filled this summer! We’d also like to thank Mother Liz for holding chapel for our little ones, and the Sunday School teachers for making sure the classrooms are ready on Monday mornings for the children to arrive and get their day started. Thank you for allowing us to use the Parish Hall when needed too. We just used the hall to have our first annual Grandparent’s Dance and it was a great night with music, dancing, and refreshments. We had 100 people in attendance. 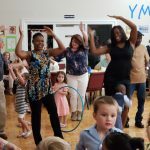 We loved providing the opportunity for the grandparents to have some dancing fun with their grandchildren. We are looking forward to a successful school year and can’t wait to see all the ways God is going to use us in the children’s lives this year. Remember: the church is always invited to attend our Christmas program and graduation ceremony. A special thank you to the church and all the lovely volunteers for their help during this summer’s Hero Central VBS. We had around 100 kids on campus and they had a blast! From Charmaine helping me with the color printer to ensure the perfect name tags to Oscar, Sylvia and the youth moving the Fellowship Hall dividers to the sanctuary to create our “cityscape”, VBS has truly been a work of love. Through this week, I’ve watched the volunteers holding hands and comfort crying kids as well as helping them create art and explore what it means to be a true hero in God. For me, it was easy to see what a hero was because any group of people who give up time–our most important non-renewable resource–to help foster God’s love in our youth are heroes in the truest sense of the word. 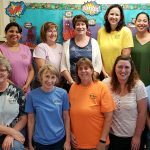 A heartfelt thank you to all of you, especially the center leads who spent many hours preparing their center – VBS would be nothing without you. You are all heroes!